Explanation: Hot gas frequently erupts from the Sun. One such eruption produced the glowing filament pictured above, which was captured on July 19 by the Earth-orbiting TRACE satellite. The filament, although small compared to the overall size of the Sun, measures over 100,000 kilometers in height, so that the entire Earth could easily fit into its outstretched arms. Gas in the filament is funneled by the complex and changing magnetic field of the Sun. 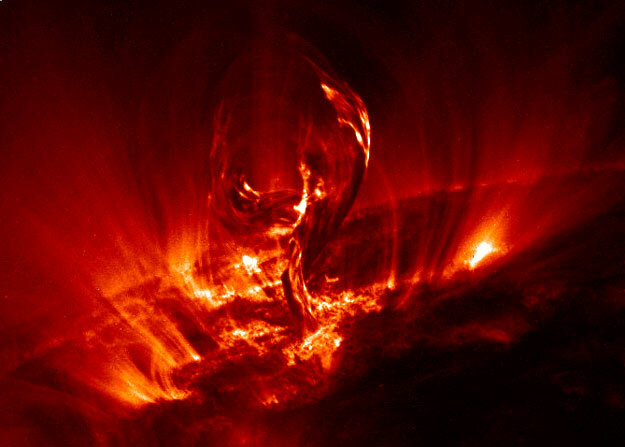 After lifting off from the Sun's surface, most of the filamentary gas will eventually fall back. More powerful solar eruptions emit particles that reach the Earth and can disrupt manmade satellites. The cause and nature of solar eruptions are the topic of much research.